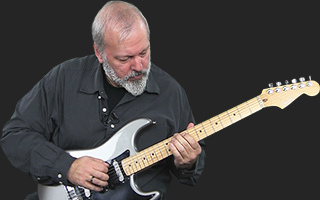 Mike Keneally takes a lick that is traditionally used in a 12 bar blues progression and re-harmonizes it with two very interesting chord progressions. Play the same lick but it takes on a completely different vibe over new chords! Join Mike Keneally in a retrospective of his music over the past 3 decades. His work with Frank Zappa, Steve Vai, Joe Satriani, Dethklok and others have heavily influenced his own original compositions creating a truly unique mash up of eclectic styles. About Mike Keneally View Full Biography Mad Scientist guitar player for Frank Zappa, Steve Vai, Joe Satriani, Dethklok and others brings a retrospective Artist series to JamPlay. Draw on his experience as a "first call" band leader and musician, learn how to put old licks into a new context, and learn to play passages of many staple Keneally songs that span his lengthy and diverse career! Mad Scientist guitar player for Frank Zappa, Steve Vai, Joe Satriani, Dethklok and others brings a retrospective Artist series to JamPlay. Draw on his experience as a "first call" band leader and musician, learn how to put old licks into a new context, and learn to play passages of many staple Keneally songs that span his lengthy and diverse career!